This chicken-fried steak (CFS) challenge features two of Houston’s traditional CFS heavyweights: Ouisie’s Table and Hickory Hollow. 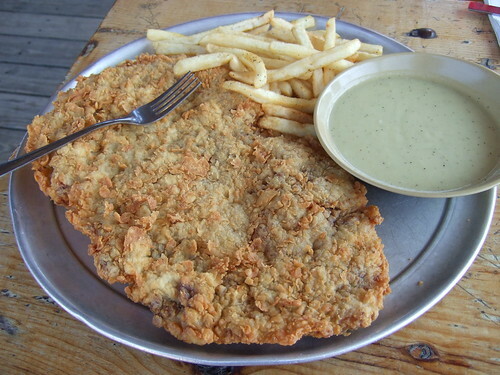 Although the chicken-fried steaks at these two restaurants are consistently rated as the best in Houston, both the restaurants as well as their corresponding steaks are worlds apart. 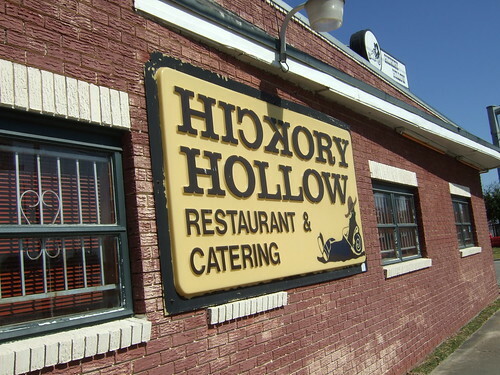 Hickory Hollow has been serving CFS and other comfort foods in gigantic portions at reasonable prices since 1977. Located in a time-worn brick-sheathed building on Heights Boulevard (there are two other locations) just north of a rapidly gentrifying stretch of Washington Avenue, it caters primarily to a mixed blue-and-white collar crowd. On a recent weekday lunch, the restaurant was packed with a mix of downtown office workers, hipsters from the adjacent Washington corridor, elderly patrons who appeared to be longtime regulars (judging from the banter at the counter), and a table full of police officers. This is a counter-service restaurant: get in line and peruse the wall-mounted menu. Step-up to the counter, place your oder, pay, and then you get one of those buzzer things to take with you to your table. You are provided with a tray, and you pass through a salad bar and self-serve drink area. It’s a great communal atmosphere, with small four and two-top table intermixed with communal and picnic tables. When the buzzer goes off, you trek back to the counter to pick up the order yourself. The CFS comes in a whopping four sizes: from the “Small Cowgirl” (billed as “perfect for the ladies”), the “Small Plowman” (“perfect for lunch”), the “Medium Hired Hand” (“Texas size”), and the “Large Rancher” (“the Saddle Blanket”). Prices are very reasonable, ranging from about eight dollars to thirteen dollars. A salad is included, and a choice of fries or a baked potato. I ordered the Large Rancher with fries ($11.49). Meat. The steak itself was fresh, nicely tenderized (fork tender), with a good thickness and perfectly cooked. Regrettably, the meat itself was completely devoid of seasoning. Crust. The crust was fried to a gorgeous golden-brown color – this is what a CFS is supposed to look like. The crust was wonderfully crispy and although it pulled apart from the meat, the overall technical execution of the steak was excellent. Unfortunately I found the crust, like the meat, to be devoid of any flavor or seasoning. Value. Excellent. The mammoth “Large Rancher” CFS is a steal at $11.49 (with fries) or $13.49 (with baked potato). Extras. I did not notice (and was not offered) any standard CFS extras like rolls or cornbread. Overall grade: B- . That such a beautiful looking CFS could taste so bland is depressing. But if you can spice it up yourself with some salt and pepper, ketchup and tabasco, this huge portion at the right price is worth the trip. Ouisie’s Table is a meandering maze of a restaurant off San Felipe in the decidedly upscale Afton Oaks/River Oaks neighborhood. The crowd is upscale too, as is the menu – billed as upscale southern food with eclectic tendencies. Still, sitting in the main dining area with other diners who, on another night, might be at Tony’s or Del Frisco’s, you can’t help but feel at home. An army of servers and staff flitter about the room, graciously taking orders and fussing over the clientele. The chicken-fried steak here is a centerpiece of a large menu of kicked-up southern comfort dishes like shrimp and grits and fried oysters. Ouisie’s serves food that people like to eat – a restaurant strategy that isn’t as obvious as you might think. And customers reward owner Elouise Adams Jones with an often full dining room. Not unexpectedly, wine is big here. When we sat down, the waiter rattled off any number of expensive bottles and wines by-the-glass. I can’t bring myself to drink wine with CFS, so I opted for a good ol’ Shiner Bock (which turned out to be a great pairing). The CFS is billed as “The Ouisie’s Original Chicken Fried Steak with The Works” at a relatively eye-popping $23 for dinner ($17 for lunch). The “works” being mashed potatoes, gravy, black eyed peas, mustard greens, and corn pudding. Meat. The steak itself was pounded thin, very tender, with excellent moisture and good flavor. This is a high quality piece of meat. Crust. Extremely crisp and crunchy, with an undulating golden-brown color, the steak appeared to be pan-fried (that may explain why the steak was slightly greasy). There was minor separation of crust and meat. Excellent flavor and seasoning. Gravy. This is a peppery cream gravy in the classic Southern tradition. The flavor was outstanding, but the consistency was somewhat watery – I prefer my gravy a little thicker. Value. Average. The large CFS and plentiful sides certainly justify the $23 price tag, but it’s still a bit steep for a traditionally blue-collar dish. Extras. Before the CFS came out, a plate of tiny biscuits and cornbread was provided for noshing. Tasty but not really impactful on the CFS experience. I single-serving bottle of Tabasco sauce was provided with the CFS – a nice touch. The mashed potatoes that came with the CFS were some of the best I’ve had in Houston. Overall grade: B+. Great flavor and execution, along with some delicious sides, make up for the hefty price tag. All things considered, Ouisie’s Table wins the matchup with Hickory Hollow. Great flavor and abundant sides win out over the huge portions and reasonable prices. This blog entry was originally posted 1 December 2010 on the www.29-95.com website. 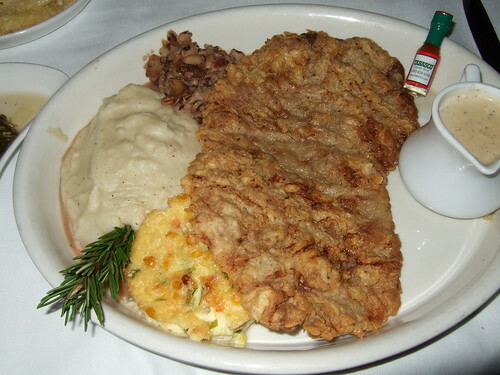 This entry was posted in 29-95, CFS Challenge, Food, Houston Chronicle, Print and tagged cfs, chicken fried steak, hickory hollow, ouisie's table. Bookmark the permalink. Ouisie's looked much better. The mini Tobasco was a nice touch. I enjoy your reviews! Thanks for all the places now on my wish list lol! I’d love to teach the Houston (and surrounding area) restaurants how to make the best white gravy/white sauce (whichever they prefer to call it) for CFS. Haven’t had a CFS with a good gravy/sauce in Texas yet … still looking.